Paediatric dentistry has become a recognised field because more and more kids are suffering from dental disease. Food habits play an important role in shaping the child's dental and hence overall well-being. Healthy eating habits play an undeniable role towards acquiring those pearly whites. It is a general opinion that chocolate is the biggest culprit causing tooth decay. However biscuits and chips that stick to teeth are equally harmful. Especially snacking on junk food in between meals causes more damage as do aerated drinks and sugar-loaded beverages. While it is impossible to keep tabs on everything the child consumes, it is worth the effort to restrict the intake of junk food, biscuits, chocolates and above all soft drinks. They hardly provide any noteworthy nutrition and also lead to tooth decay. Instead, try to get the child used to eating healthier stuff like fruits or nuts, not just for their health quotient, but also for the cleansing effect as an outcome of the biting & chewing therein. Most often, the initial offences towards our teeth start at early childhood or even at the infancy stage. Ideally a child should be weaned off breast milk when teeth start erupting. Breast feeding or bottle feeding or using pacifiers to put a child to sleep causes pooling of sugars in the mouth. Decay-causing bacteria are at peak during sleep. Hence this increases the chances of a condition called ‘Rampant caries’ or ‘Nursing bottle caries’. 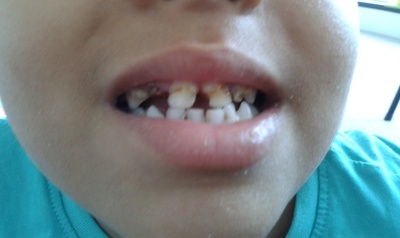 This involves rapid decay of teeth especially the upper front teeth, and is evident at the pre-schooling stage (3-5 years) when milk teeth are fully formed. This condition not only causes pain and discomfort in eating but also affects the looks and speech. Missing front teeth can cause abnormal positioning of tongue and lips and also hampers jaw growth. Likewise, ill-formed, ugly-looking teeth can subject the child to mockery among peers and hamper social development. All these factors can have profound effect on the psychology of the child. Good dental habits started in early childhood go long way into adulthood. Rinsing after every meal is non-negotiable. For smaller babies, make it a practice to rub their gums with water after each feed or allow sips of water to clean off the remnants of baby food or milk. Bottles or pacifiers used to put a child to sleep should be avoided, as far as possible. If they are used, use the above technique to clean off the leftovers from sitting on the teeth or gums while the baby is sleeping. Parents should brush the child’s teeth until almost 5 years of age and thereafter they should supervise. Brushing at night is very important. Encourage spoon-fed consumption of liquids or food instead of sucking out of bottles. Apart from being a natural way of eating, it also allows the jaw muscles to get some exercise. By the age of one, introduce a mug for drinking liquids. In spite of taking care, tooth decay may occur. As the baby teeth are small, decay tends to spread fast and attack the entire tooth in a short span of time. A badly decayed tooth may even give rise to swelling & fever. Hence parents should regularly inspect the child’s teeth for any white/black spots and take them to the dentist without delay so that they can be attended at the onset. This also helps keep “dentist phobia” at bay in kids. Thus, a few easy measures go a long way in acquiring a beautiful set of teeth that last a lifetime. After all, everyone likes a smile, and it’s the teeth that make it worthwhile! 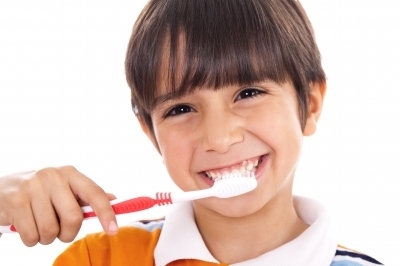 Read an Introduction to dental care for kids here.